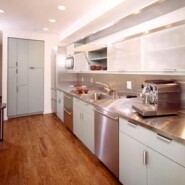 “This was originally a very narrow kitchen; we kept the galley shape but opened it up by making the doors wider. The silver pine cabinetry by Heritage was a part of this. Because there are no windows in the kitchen itself, we didn’t want it to get too dark.